March has had so many flowers beginning to bloom, so much work done, so much growth on everything telling me spring really is here now and even if there are any more cold days the progress of the plants is now unstoppable. 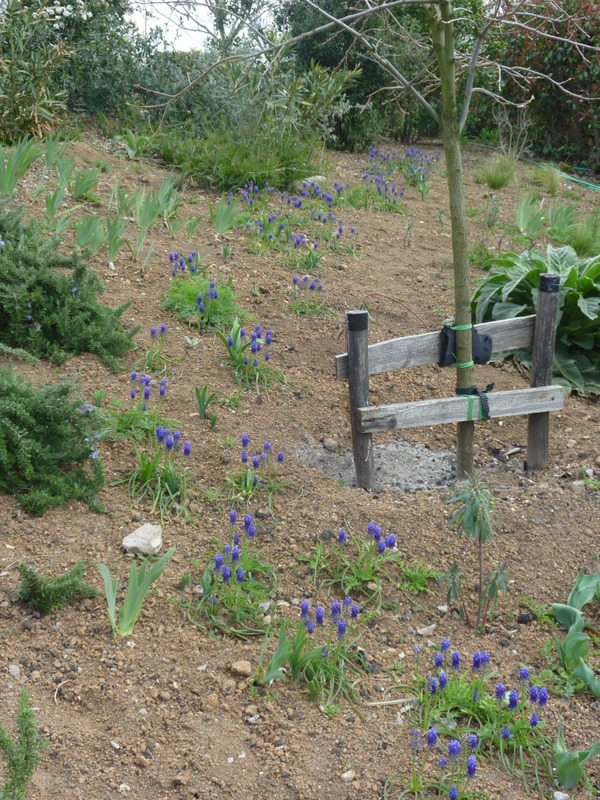 Those of you who have been following my end of month reviews will know that I have been concentrating on the slope or bank which I planted last autumn with mainly plants that had self-seeded in the rest of the garden. 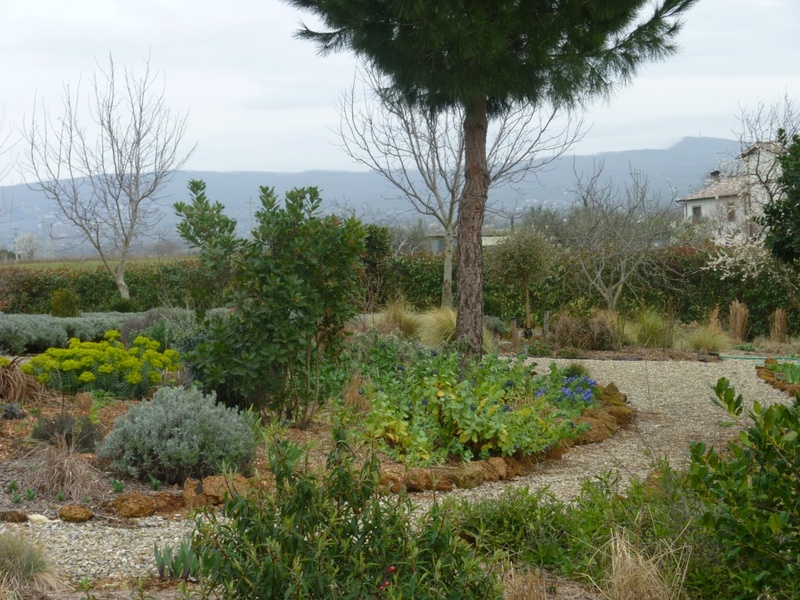 Interestingly in March’s issue of Gardenia (the Italian Gardening magazine I subscribe to) there was an article about designing a border with just plants that would self-seed; this would mean that the planting wouldn’t actually be static but change over time as plants died and new seedlings grew in slightly different places. 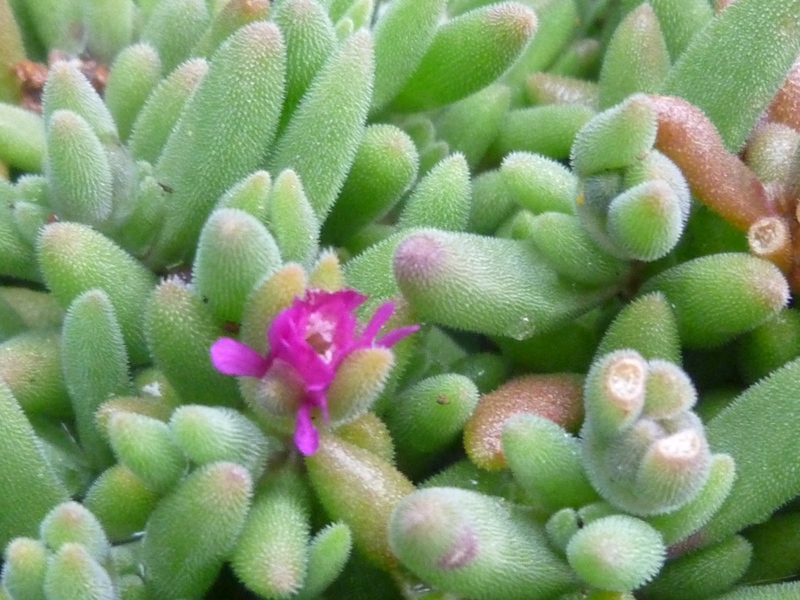 All the plants I’d used were mentioned and there was a list of others that I will consider using too. The Gaura and Stipa are filling out very fast and of course the Verbena bonarienis can’t be stopped! 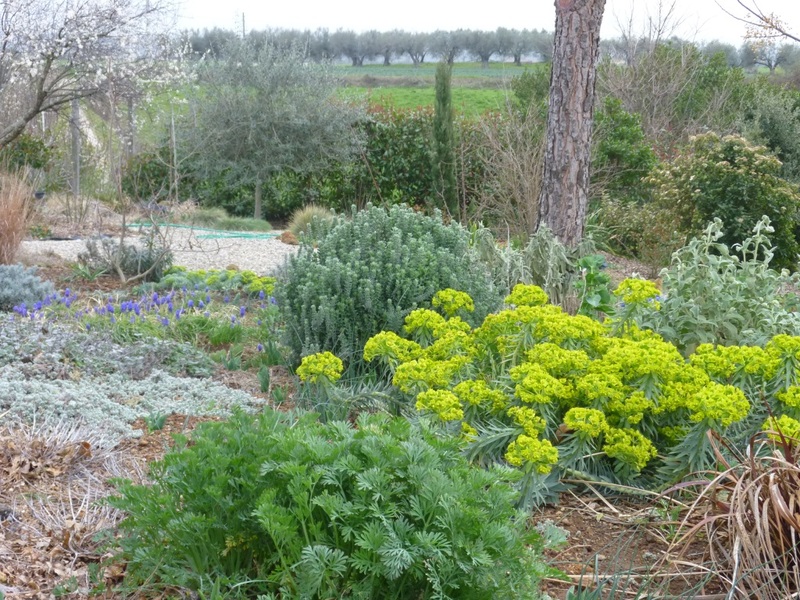 Artemisia pontica that was planted with the Muscari to hide their leaves when they finish flowering is emerging from the soil – I’m amazed so much is growing as only tiny pieces with a little root were taken directly from the parent plants in the Large Island Bed. 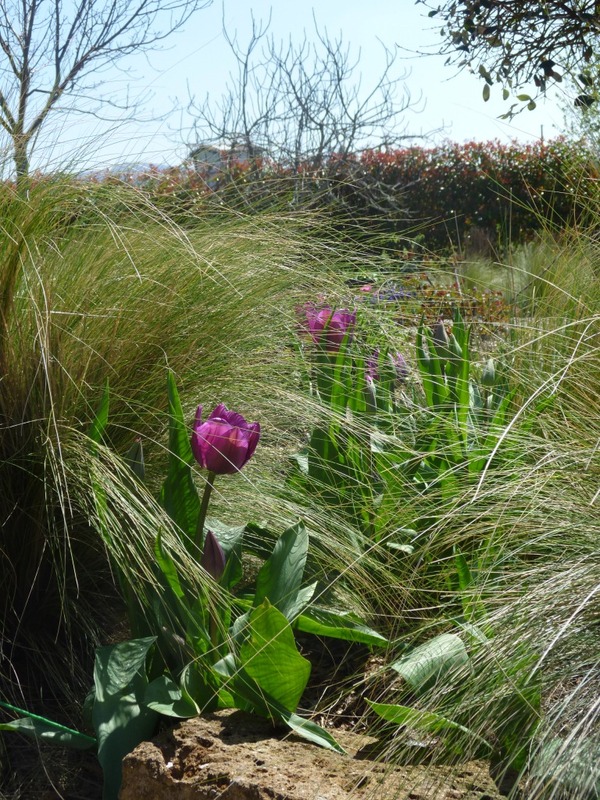 It is a bit of a thug; the underground runners spread very quickly through a border, I may remove it from the Island (if I can) and just let it colonise the slope where its ground cover properties will be most useful. 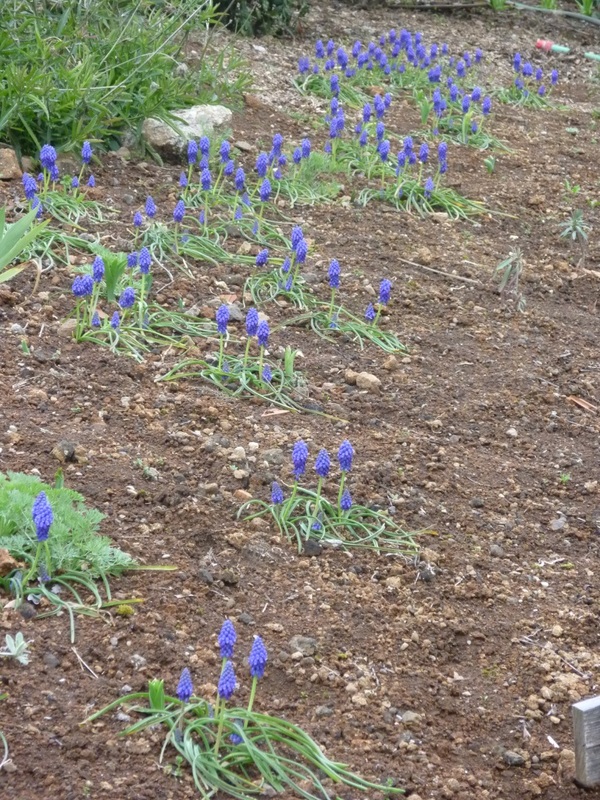 I will continue to give updates with photos of the slope as spring and summer progresses. 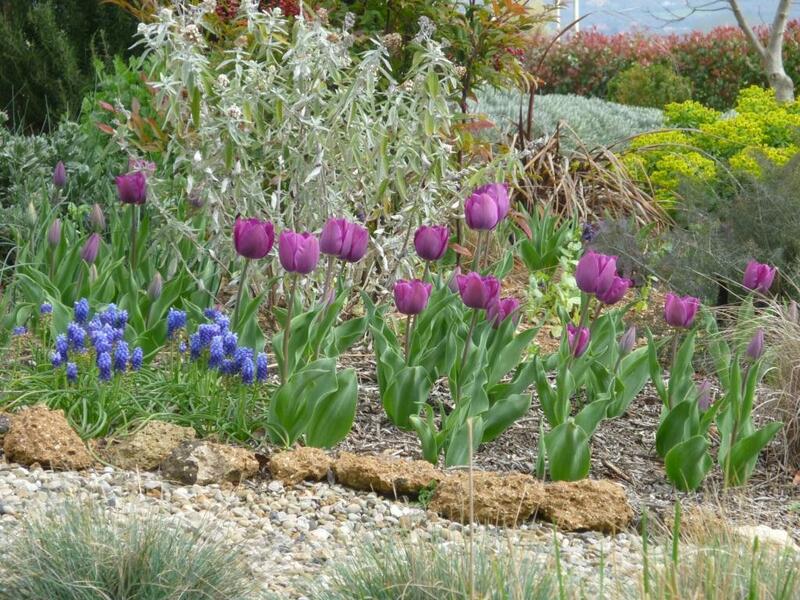 As not so much is happening on the slope I thought I’d give you a taste of the Tulips which may be my favourite flower (if it isn’t Wisteria). 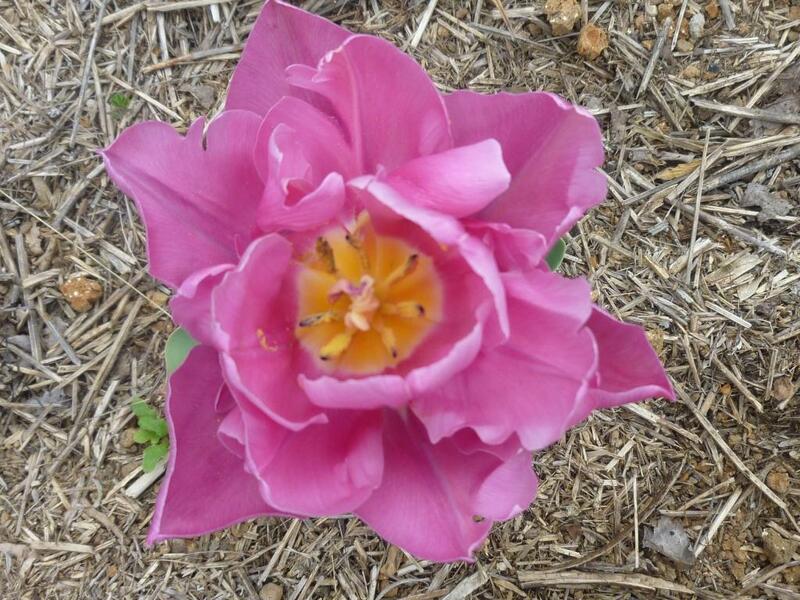 With the warm weather this week many of the tulips have stated to flower, next week I’ll post more with their names and where they are in the garden but for now just enjoy! 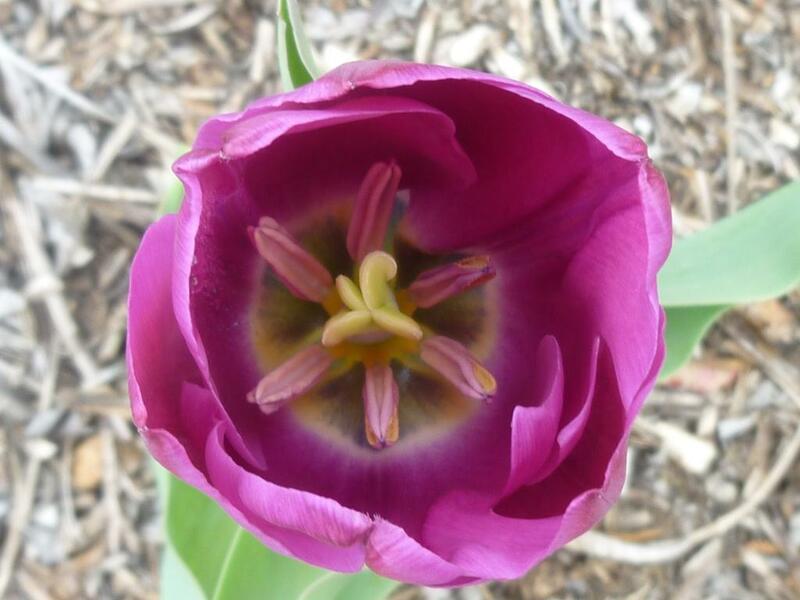 I expect I’ll be blogging almost every day with Tulips and, I hope, Wisteria during April. Next to the warm brick pillars the wisteria is nearly fully out - you can smell the perfume. A big thank you to Helen, the Patient Gardener for thinking up the idea of this meme and keeping it up (and reminding me it was the end of the month by posting her review last night). 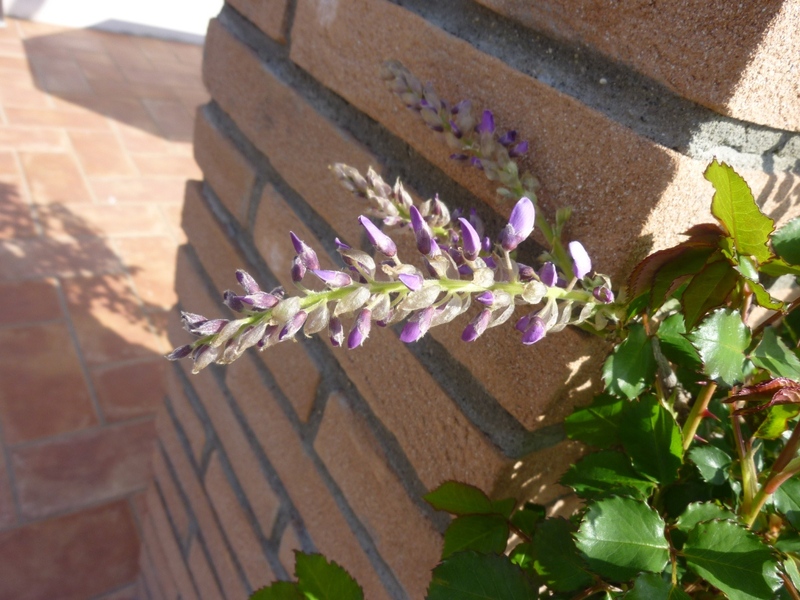 Visit her and see what’s happening in other bloggers’ gardens. And finally, next month for the end of month review my intention is to tell you about a part of the garden I’ve never even mentioned before – an area outside the garden proper that has always been abandoned – it is covered with brambles, weed trees and is where the fox likes to dig his holes. 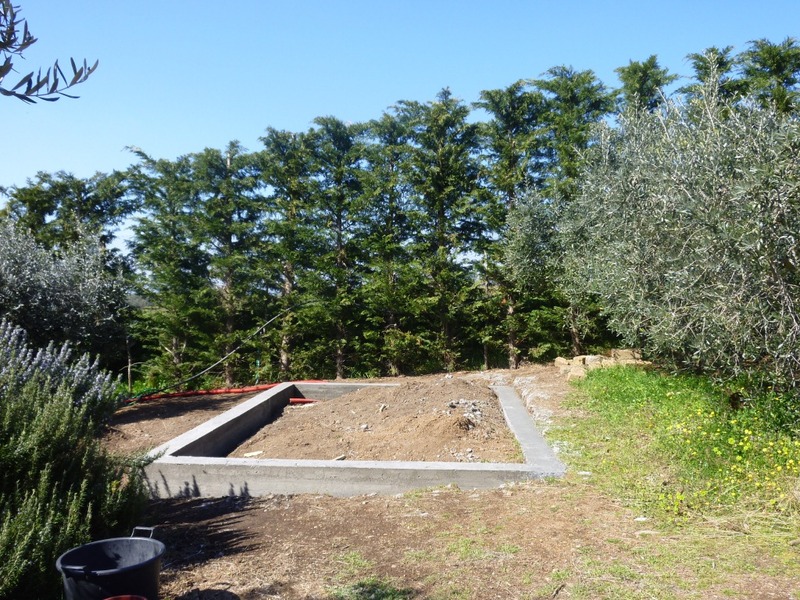 I want to make a little orchard here as it is protected from the north wind by the tuffo block. ……and also where the stone blocks that our house is built from were cut. 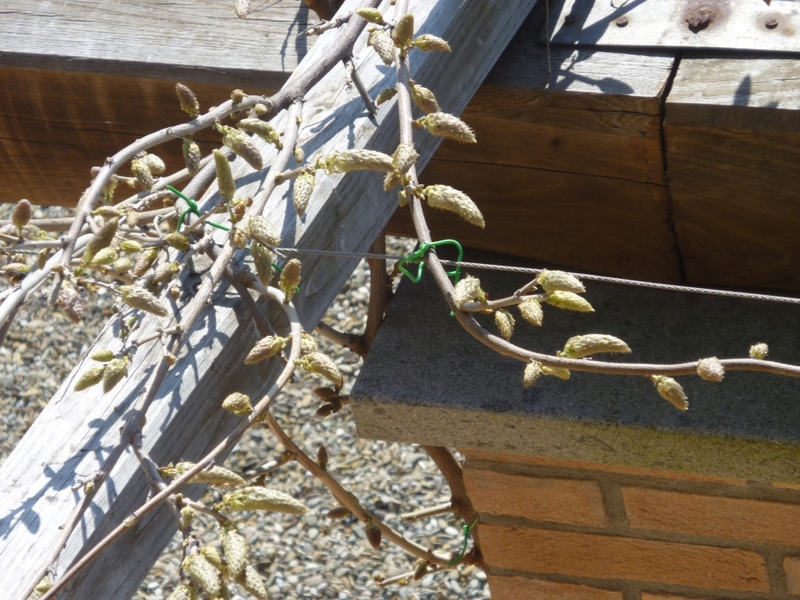 Something is taking my wisteria buds! 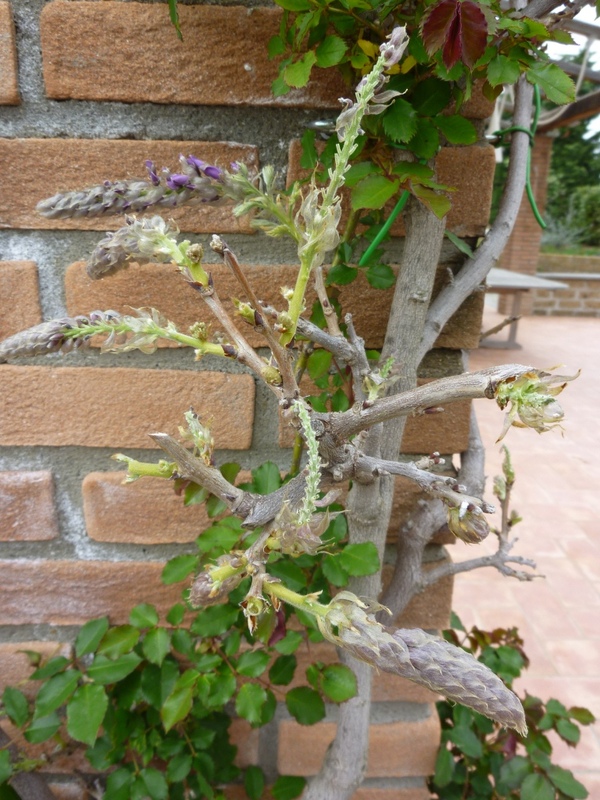 For the last few weeks I have been enjoying the sight of the buds on the Wisteria ‘Prolific’ growing over the pergola over the terrace getting fatter and bigger. 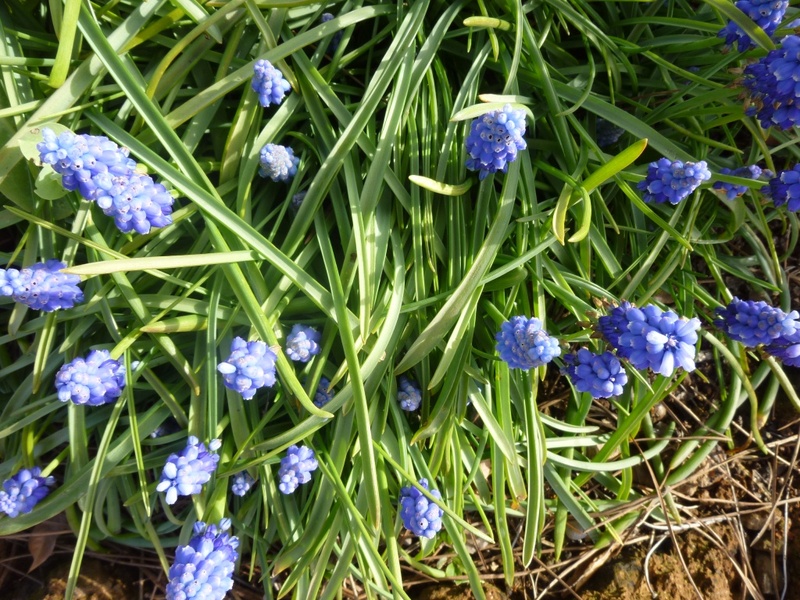 Imagine by shock, then, on Sunday morning when I went outside and found a number of the beloved buds on the ground. You can see the damage! Even though there was some wind I knew it wasn’t that – who or what then? I’m not sure; at first I thought it must be the birds pecking and breaking off the strong buds, but then I wondered about the locusts – could it be them? 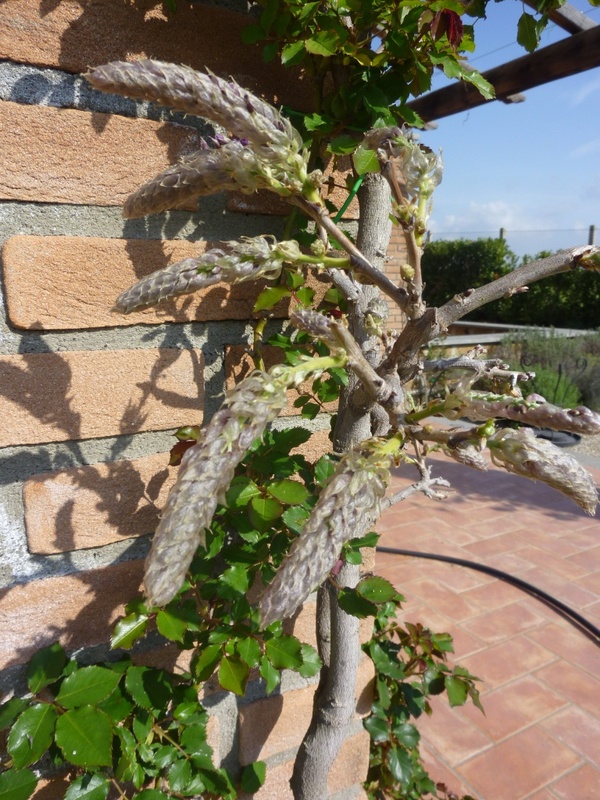 Last year the white Wisteria on the east side of the house had very few blooms (I assumed that the northeast wind that blows here had killed the early buds), this year these seem to have been pecked or eaten even more than the usual-coloured ‘prolific’. Maybe last year these were pecked before I even saw the buds. Now when I go out to look it is with some trepidation about what damage I might find. The life of a gardener is not an easy one; all the anticipation, which is of course, at least half the pleasure can be ruined by so many things outside our control: heavy rain, no rain, hail stones the size of golf balls, locusts, other pests and now birds that I have welcomed into the garden are repaying my kindness by destroying not just my pleasure but also the anticipation of the blooms to come! Those of you who have been following this blog will know that I recently purchased a greenhouse; I thought I would update you with its progress. 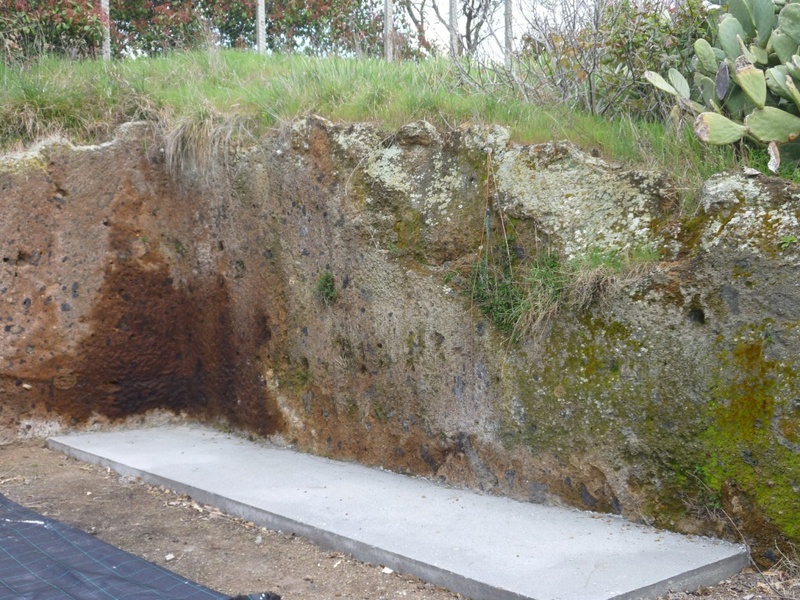 The only place in the garden to site the greenhouse is sloping so we had to build foundations to give it a firm base. 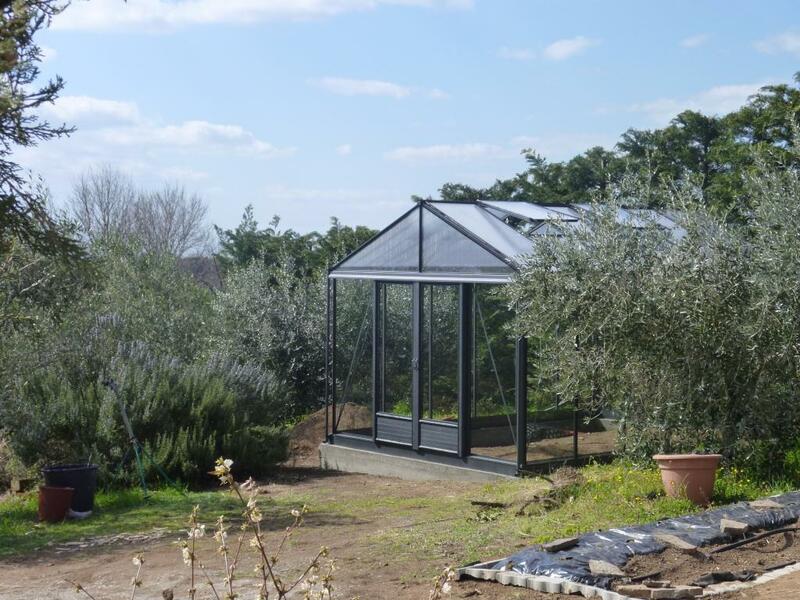 The greenhouse is 3.08 m x 4.50 m, I know I am very lucky to have such a large space and I hope to make the very best use of the possibilities this will give me. 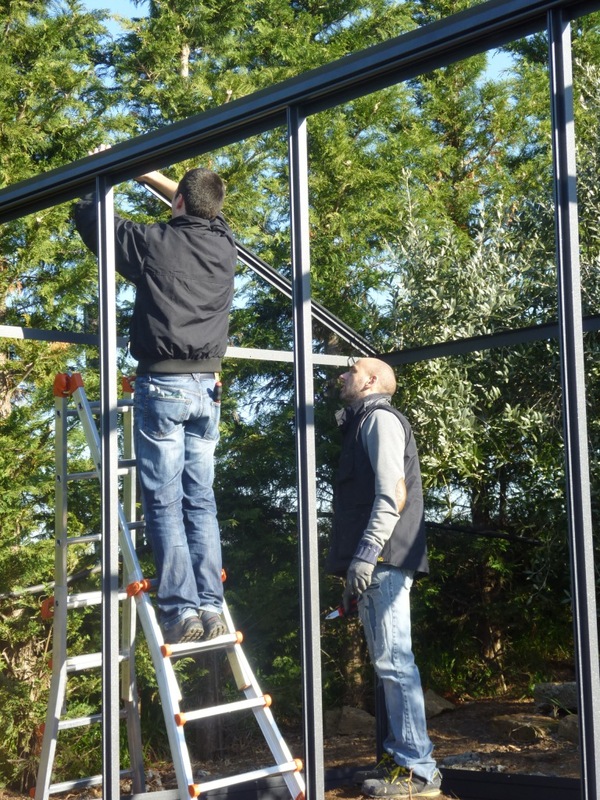 Two men managed to construct the greenhouse in 4 hours! I was most impressed, especially as they took away with them all packaging and didn’t leave any rubbish lying around. My surprise may seem unusual but very few workmen in Italy leave everything in a tidy state – I assume they believe that cleaning-up is woman’s work and therefore completely beneath them. 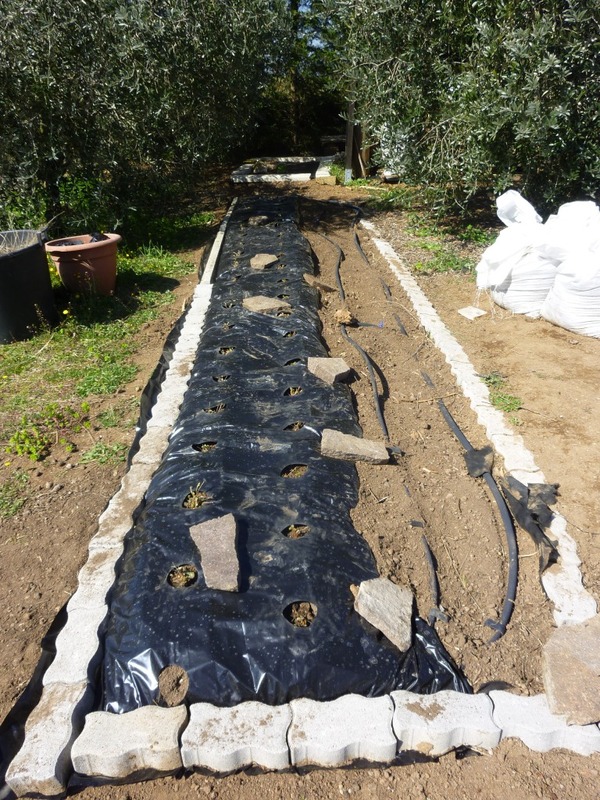 Once the inside had been dug to remove gramigna (my kind of couch grass), I set about planting some vegetables. I bought some plug plants of pacchino tomatoes and 2 types of lettuce; I planted 4 tomatoes in the bed and potted up another 3 to grow on inside until conditions are suitable to plant them outside, probably in mid-April. 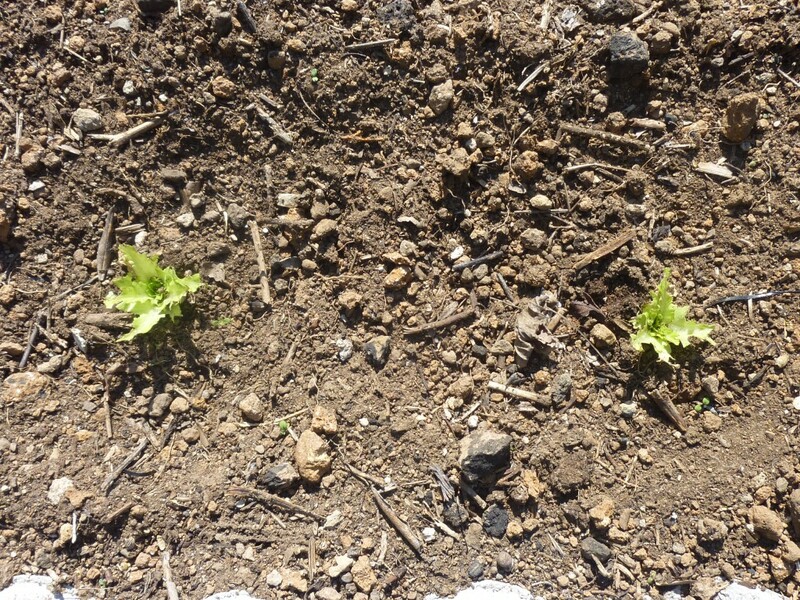 As an experiment I planted 3 frilly green lettuces in the bed in front of the tomatoes and the other three outside to see how much more quickly they would be ready to harvest. They all doubled in size in about 3 days. But the 3 I planted out may never be large enough to harvest – something is eating them. Lettuces outside, these and some others have been eaten! 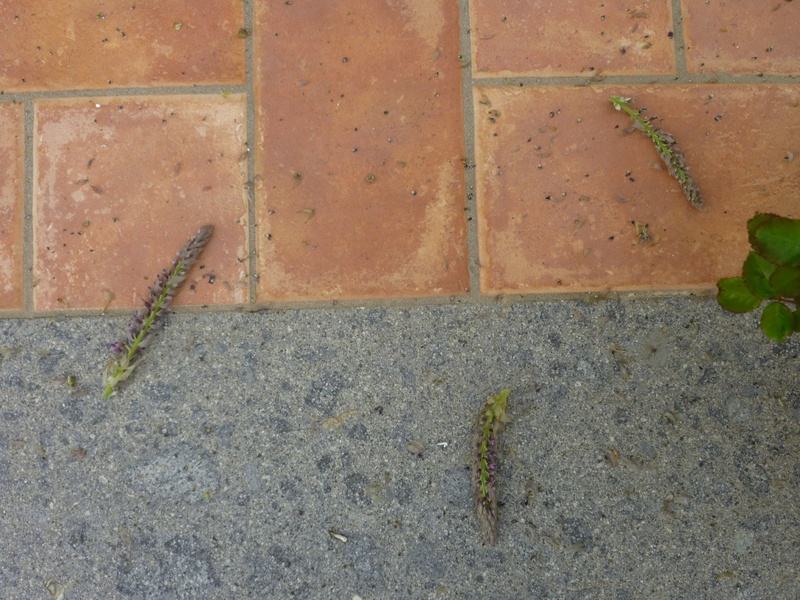 I’m not sure what is eating them, my immediate thought was, of course, slugs or snails but a friend has suggested that the damage could be caused by locusts. 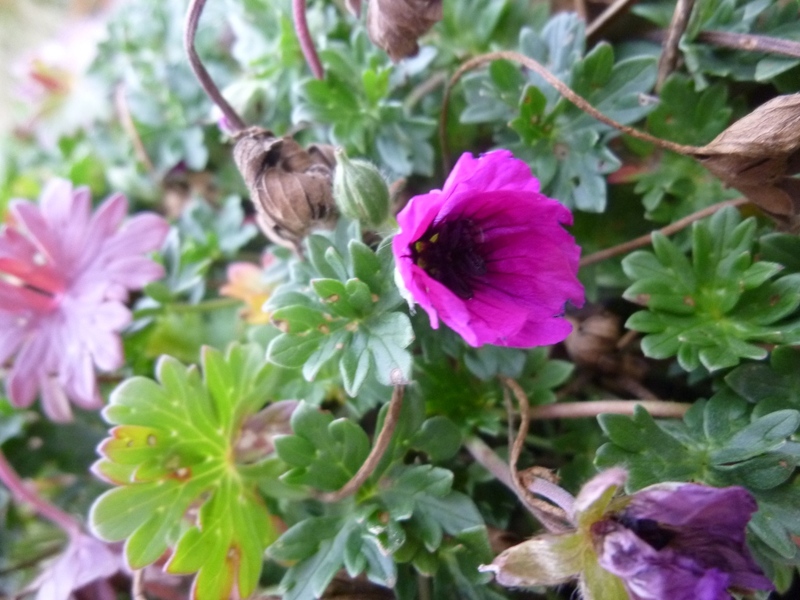 Last year there were quite a few in the garden but they didn’t appear to do any damage, with the very cold winter we’ve experienced with temperatures regularly below zero I thought they would have died but no, I’ve seen several in the garden already so it could be them. 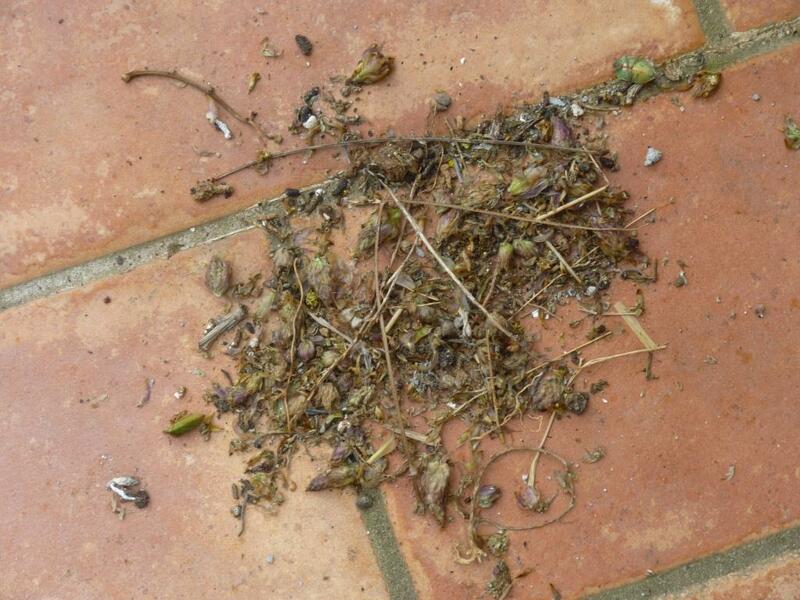 I will make more effort to kill those I see – a plague of locusts is the very last thing I want!! 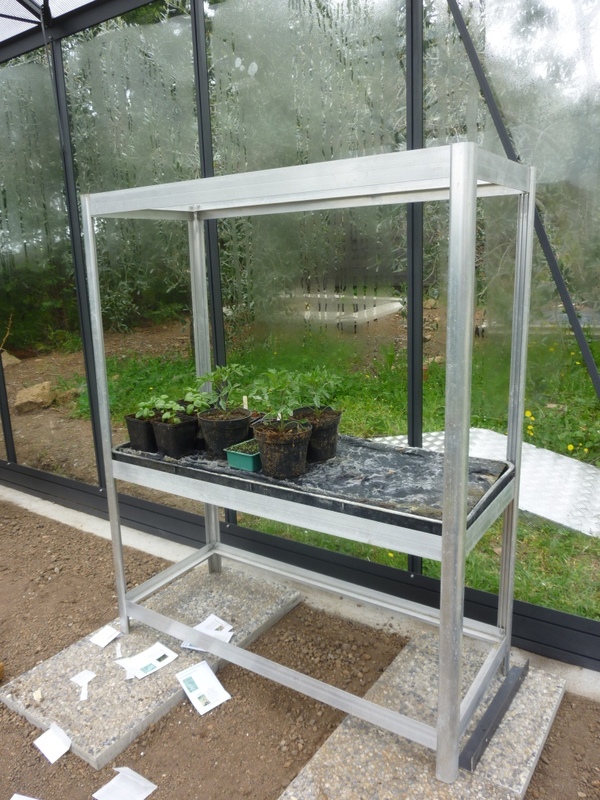 As there is no power as yet inside the greenhouse I have been using a propagating tray on a windowsill inside the house. I’m using a spread sheet so that I can see germination times for everything I sow. So far Swiss Chard Bright Lights germinated in 3 days! As did some’ old’ seed of Verbascum phoeniceum Hybrids. 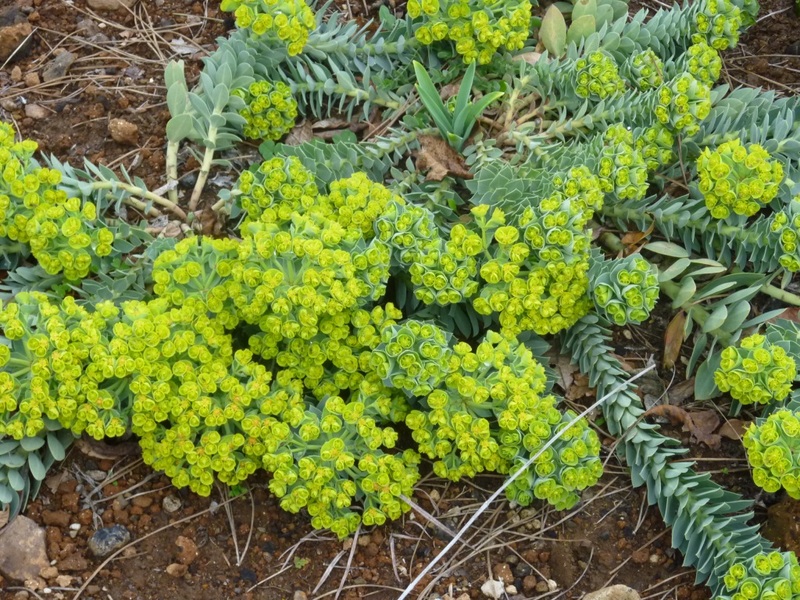 I planted the whole pack of these (it says 1000 seeds) as the pack was very out of date and I just hoped for a few to germinate. Fingers crossed they don’t rot off so the garden can be filled with colour. 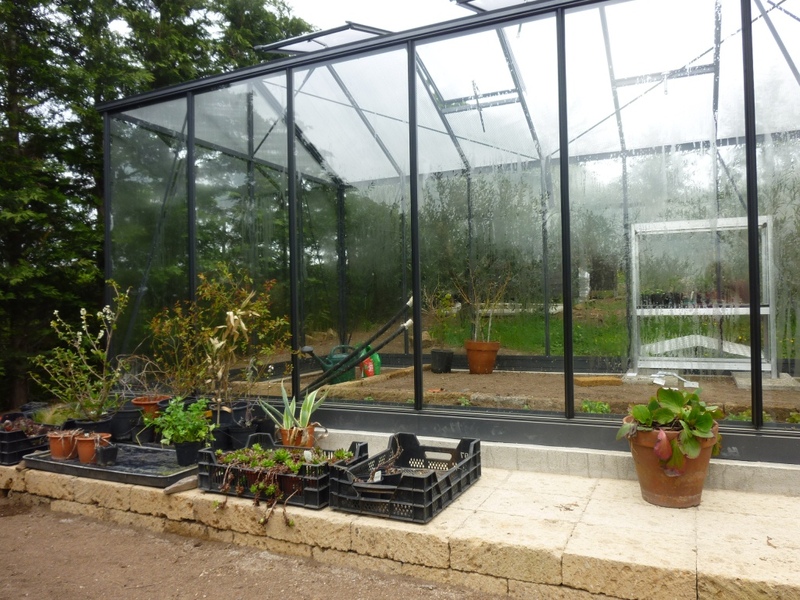 I will use the area outside the greenhouse for plants I’m hardening off and for all plants not yet planted in the garden. We’ve made a hard standing of tuffo blocks all along one side so the self-watering trays I have will have a flat surface to sit on. I also hope to get a couple of cold frames to put here. It is protected from the cold north wind here and hopefully from the summer winds from the west too. Last week for GBBD there were quite a few flowers in the garden but apart from Arabis nothing was actually bursting with flower. 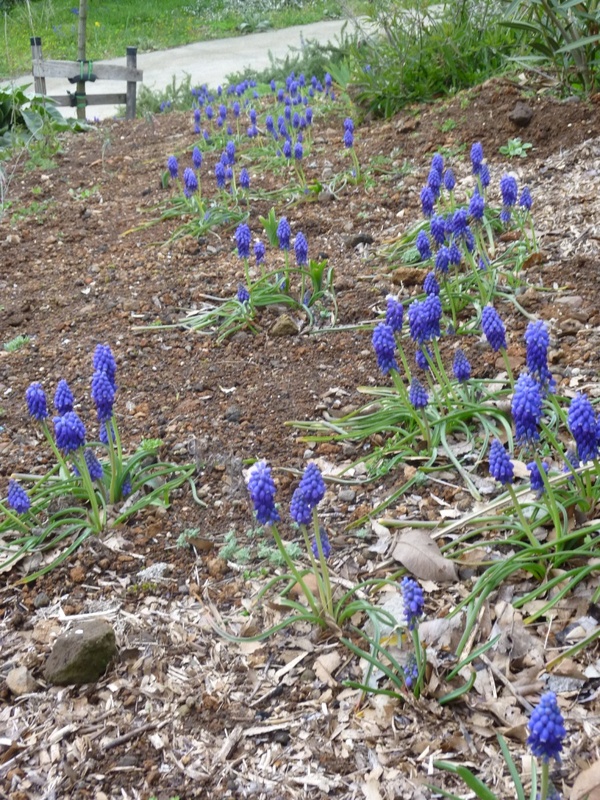 Even the Muscari that were all up somehow looked like they weren’t sure if they really wanted to be out yet, as these still look at the back of the house which in shade for a lot of the day during winter, are now standing tall. 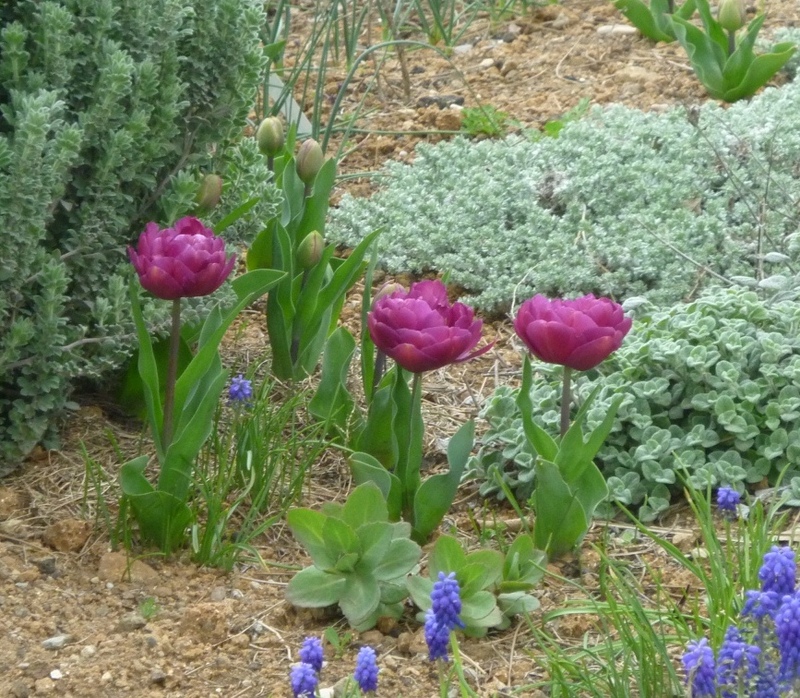 These in the triangular rose bed are much taller, I pruned back a pale pink Penstemon to be able to see them better. Those under the olives I thought would be invisible because we haven’t cut the grass yet have grown taller than the grass. 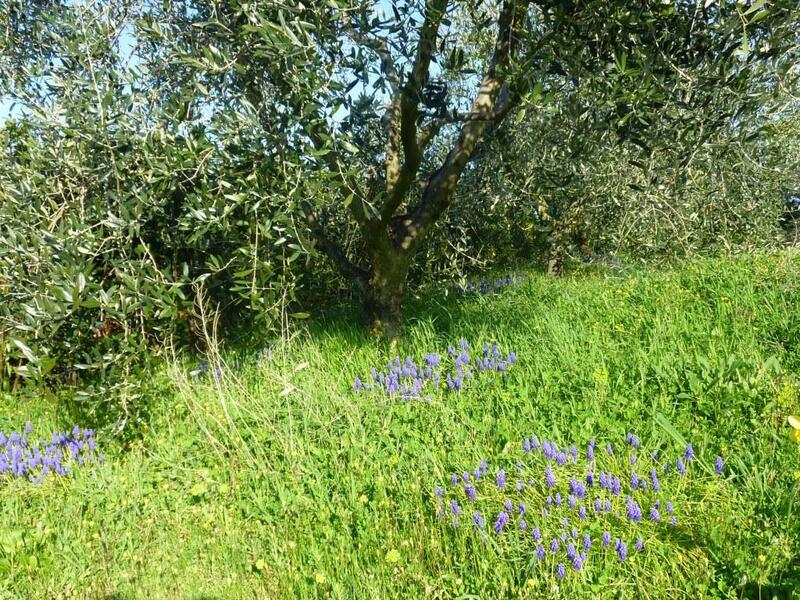 I love these bulbs under the olives and would like to plant other things but because of the danger of fire we have to cut the wild flowers and grass back before summer so other things tend to get lost – I even love all the bright yellow dandelion type weeds. Clematis armandii had some flowers a week ago but is now completed cover.ed by starry white blooms so that you can hardly see the foliage. This is the view from the sitting room window. 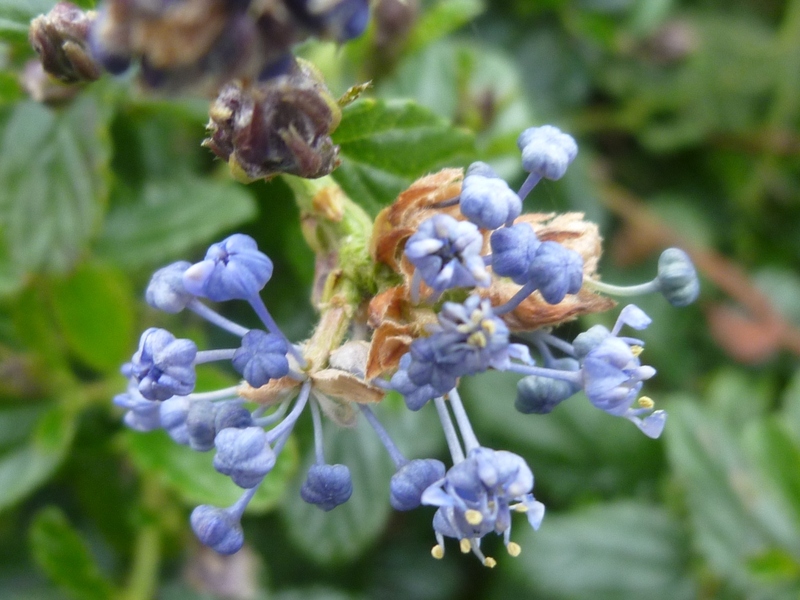 I used to grow this in England but it was always ravaged by snails who seemed to think its stem and leaves were caviar. The greenhouse is here and was erected amazingly efficiently in just 4 hours, almost more quickly than the time it took to build the foundations. 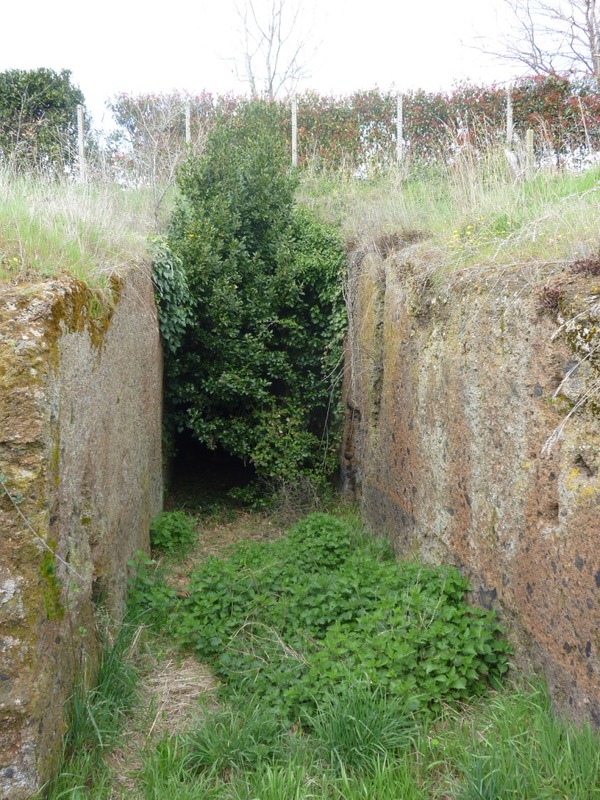 I think it looks like its always been here, the way it sits between the olives. 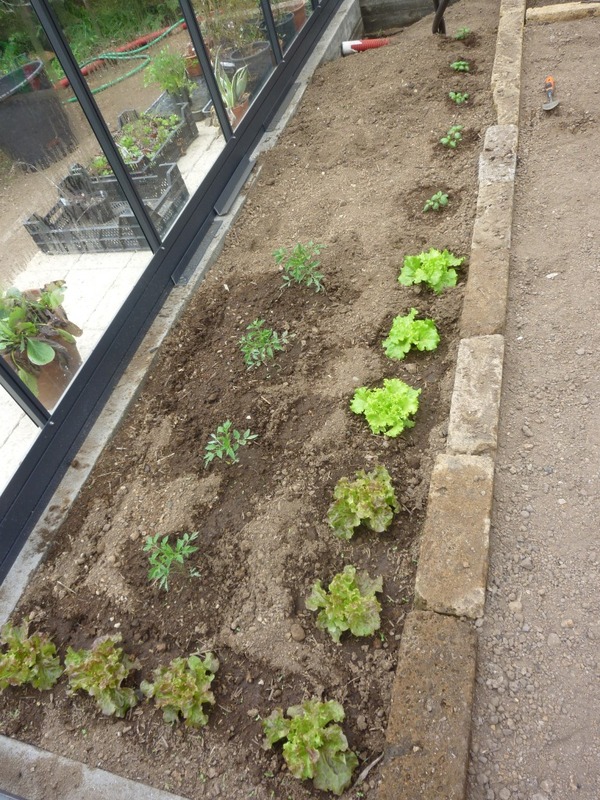 I have already planted 4 tomatoes (pacchino) and some lettuces – they all doubled in size during the 3 days I was away. I also transplanted 3 of the tomatoes into pots from their modules so that hopefully they will be larger established plants by the time I can plant them outside towards the middle/end of next month. I have also sown seeds; some basil, parsley, courgettes (all old seed so may not grow) and Swiss Chard Bright Lights (I can’t buy these here as plug plants so I buy the seed in the UK when I’m there); they should grow well here as normal green chard is very popular. The very first seeds I sowed were Knautia Macedonia sent to me by Janet at Plantalicious. I planted 30 strawberry plants (bare rooted) on 9th March; you can hardly see them in the photo as they were quite small. Now the leaves are growing well and they stand above the nasty black plastic. Where you can see the black irrigation pipes I’ve now sown some dwarf beans. 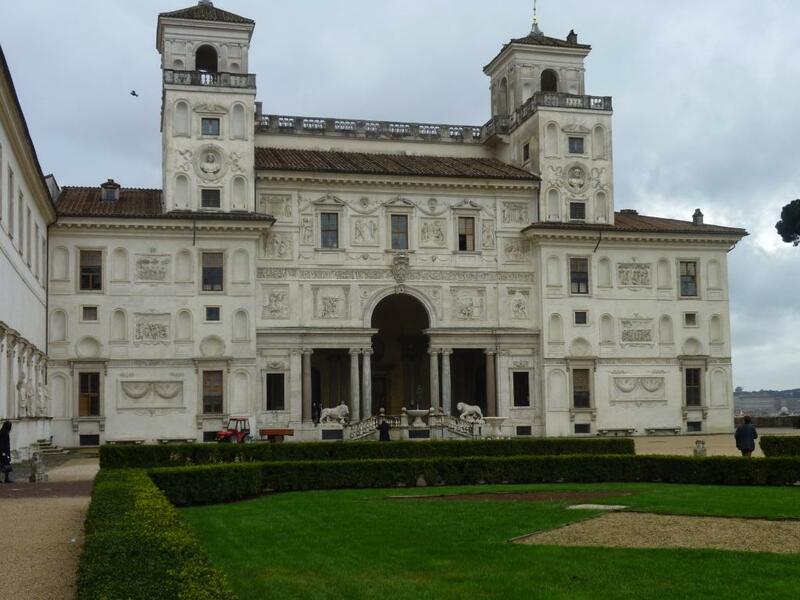 Last Thursday, Friday and Saturday I was at Villa Medici in Rome where the French academy was hosting a convention entitled “From painting to the Garden. 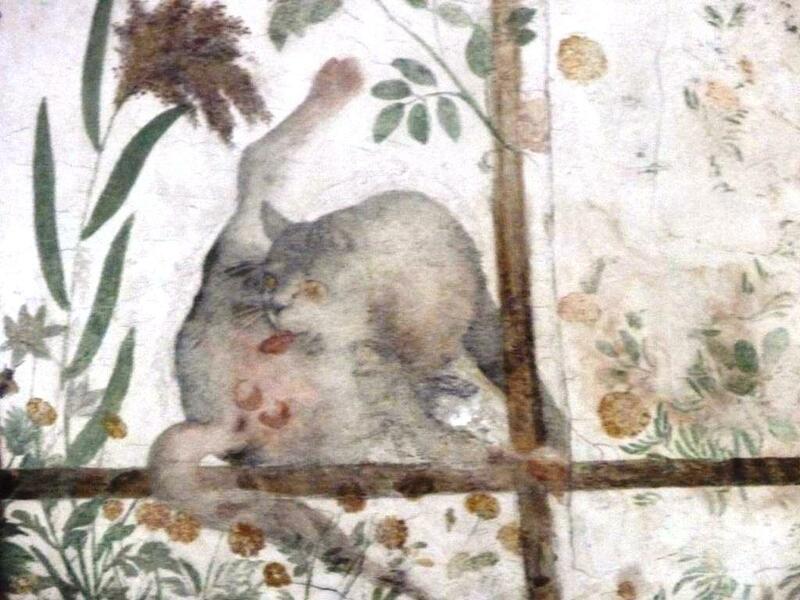 Artistic transfers from Antiquity to the present time”. Papers were given by 16 academics under the above theme although the actual topics varied greatly. I very much enjoyed the stimulation and often enlightening papers and discussion that followed. 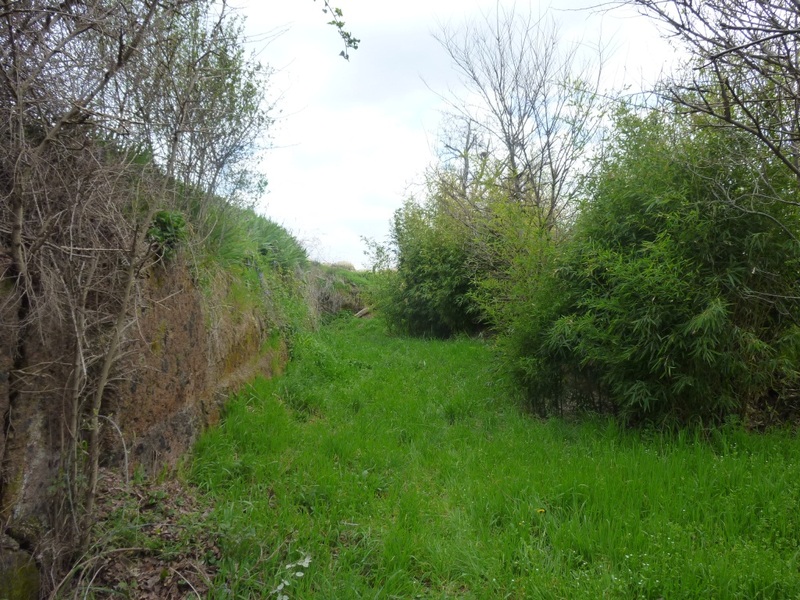 Villa Medici’s garden is under the care of the French academy and has undergone some restoration. Most of the large original sculpture that was displayed in the garden has since been taken to Florence and can be seen in the Boboli Garden or The Loggia di Lanzi in Piazza Signoria. The garden is typical of the Renaissance with compartments created from Box hedging; a part of the original garden had displays of exotic plants (which no longer exist) a ‘Ragnaria’ where wild birds were netted and a mount built on top of two ancient temples representing Mount Parnassus, this was topped by a Pegasus thereby inferring that Ferdinand di Medici was the patron inspiring the muses. 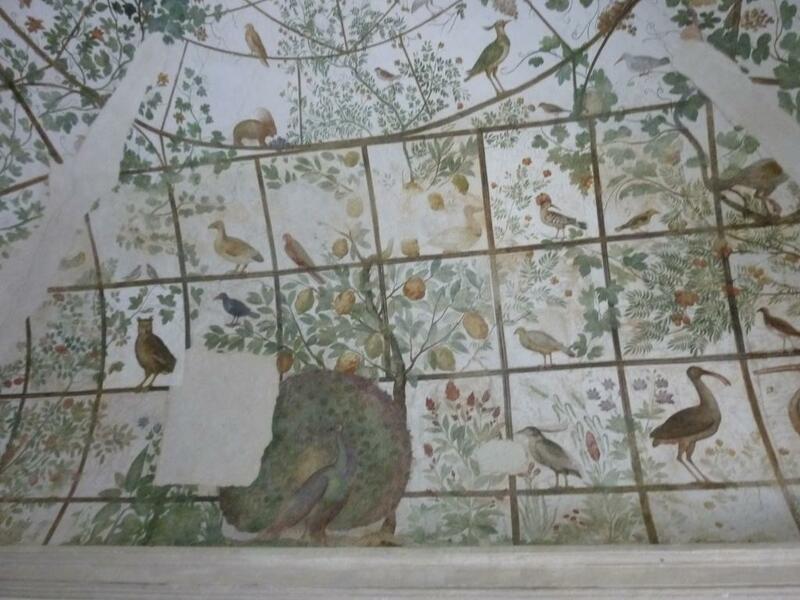 Possibly the most interesting and beautiful of the things to be found here is a study built for Ferdinand as a sanctuary from his busy ecclesiastical life, the upper walls and ceiling are frescoed with plants, flowers birds and animals showing his true love of nature. His career as a Cardinal ended when his brother unexpectedly died and he returned to Florence as Grand Duke in 1587. 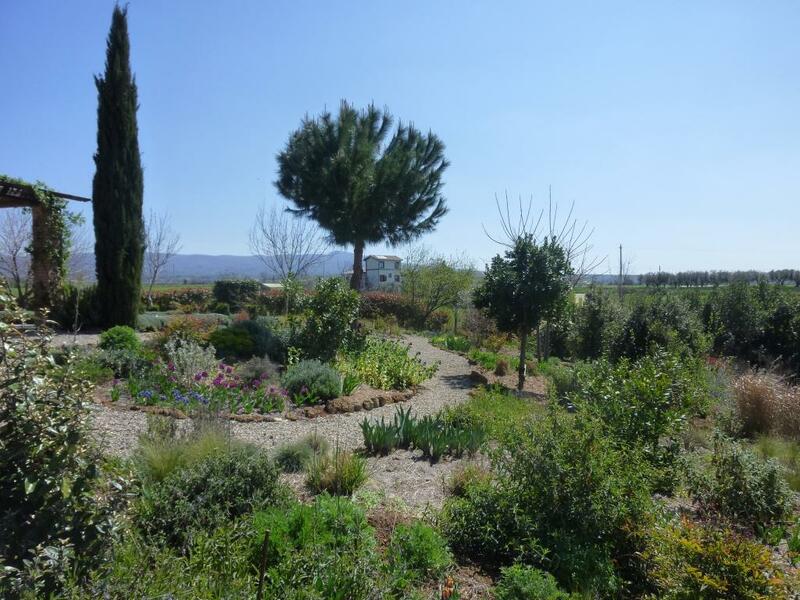 When I saw my garden on Sunday I was amazed by how things had changed in just three days, more about this, the greenhouse and the vegetable garden soon. This month the garden is really coming back to life. 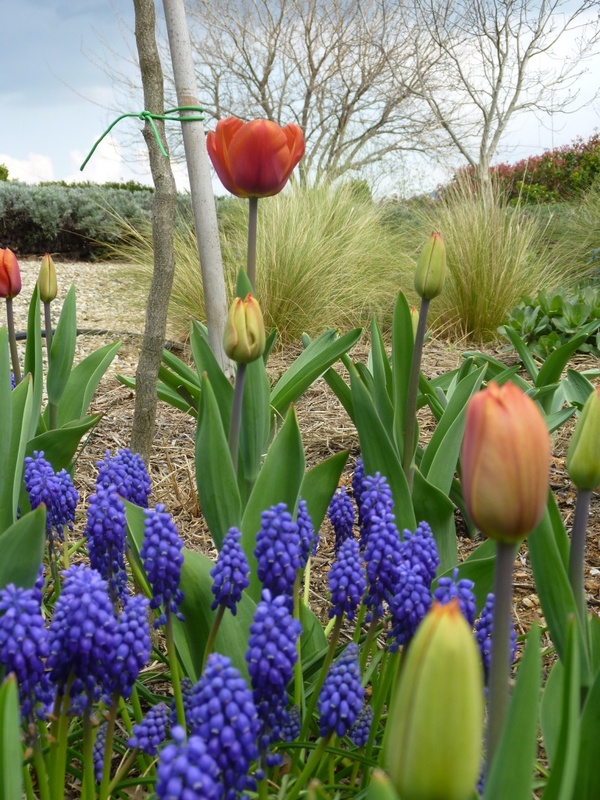 Not just individual flowers are blooming but areas of the garden are beginning to form ‘pictures’. 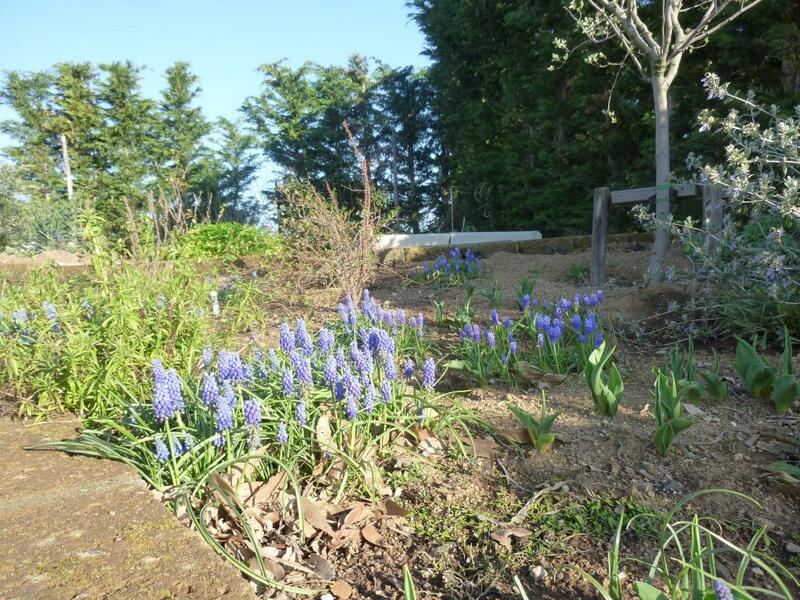 and now the Muscari planted here are beginning to look as I imagined they would. 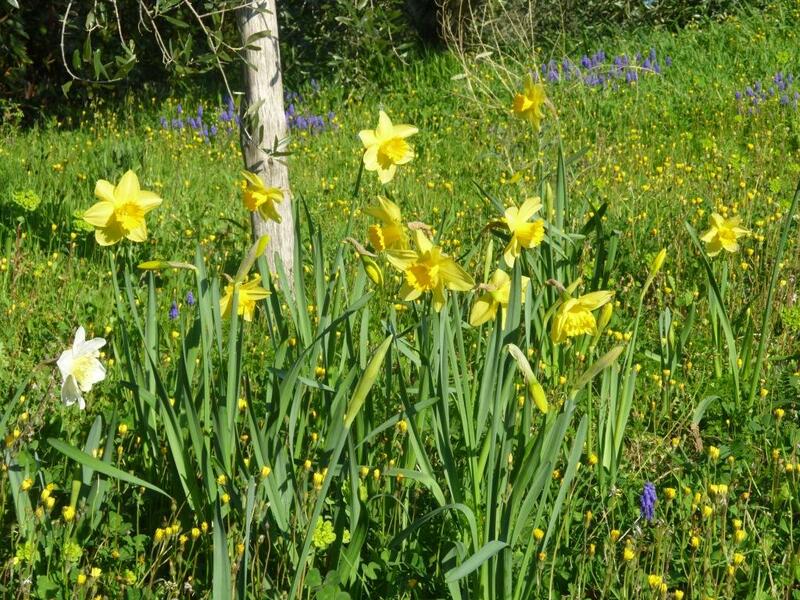 Daffodils begin late here, I think that is because they need a period of cold to prompt them into growth and that doesn’t happen until December or January in this part of Italy. 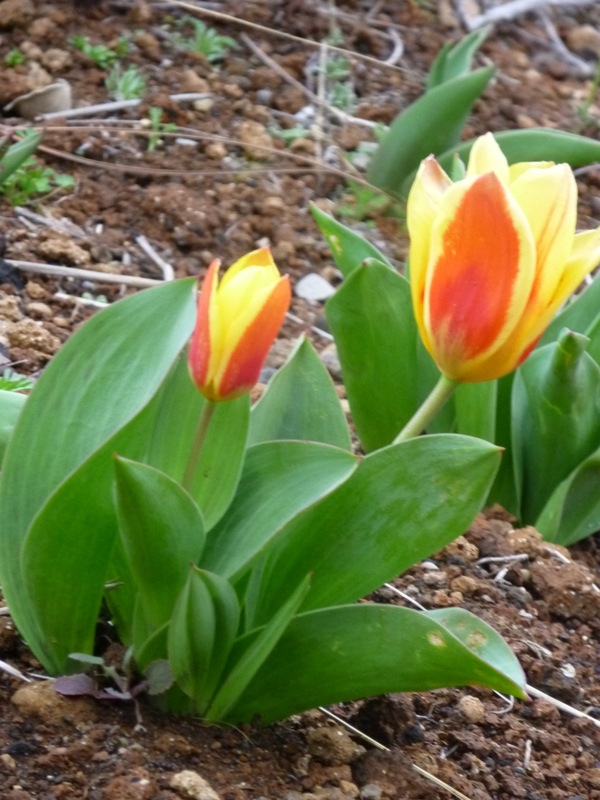 In fact these tulips were open even before the daffodils! 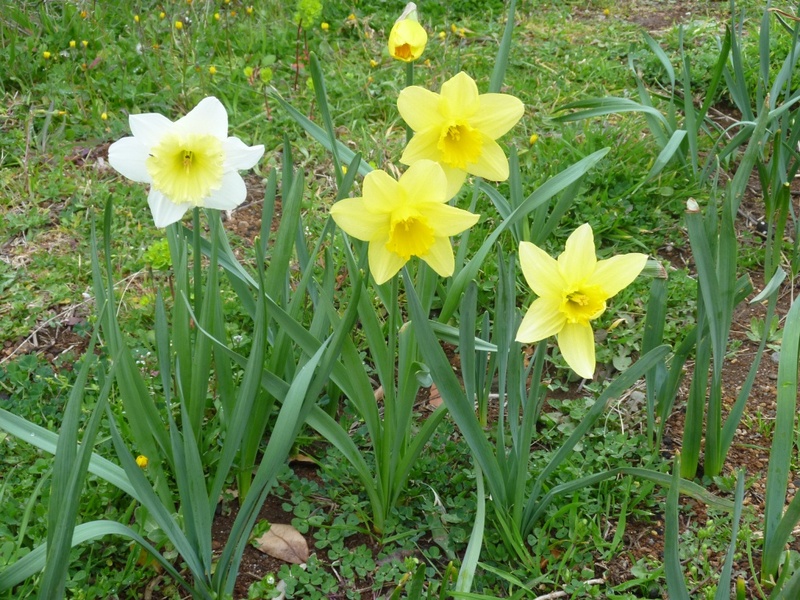 They are the sign that spring really is here (this morning it was 10° at 6.30 whereas last week the temperature was hovering around zero at that time of the morning and for much of the morning. There are a couple of surprise plants flowering all be it just a couple of flowers; this tiny, flowered Geranium began flowering last week – it is spreading very slowly under Rosa Tradescant, and a prostrate Ceonothus that I want to propagate to have as more excellent ground cover on the slope. 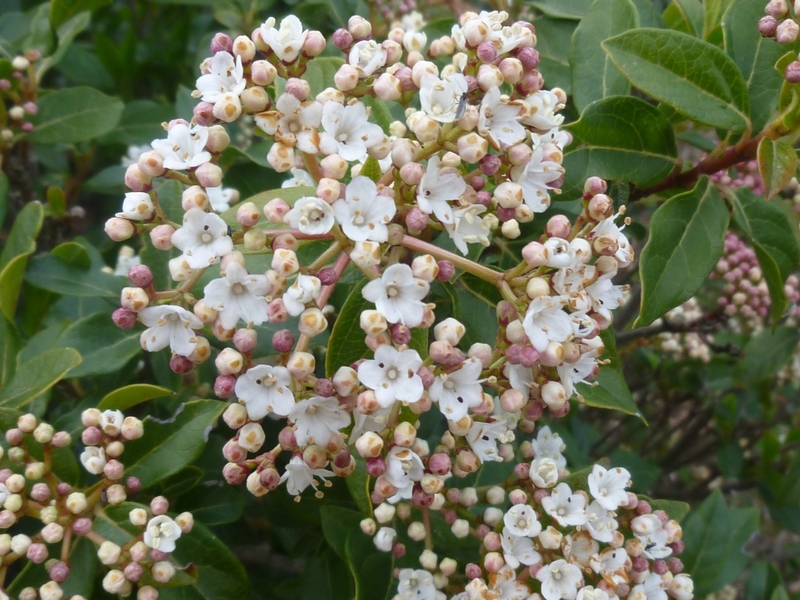 Viburnum tinus is just beginning to open its tight pale pink buds – this is another plant that behaves entirely differently in Italy to the UK. I always considered it a great value plant; flowering from October to spring, evergreen foliage always looking good and some nice black berries in summer if you’re lucky – here, though it flowers in March for about one month then the dead flowers and the foliage look horrendous for about 2 months and although it is evergreen it doesn’t exactly fill the heart with joy during the winter. 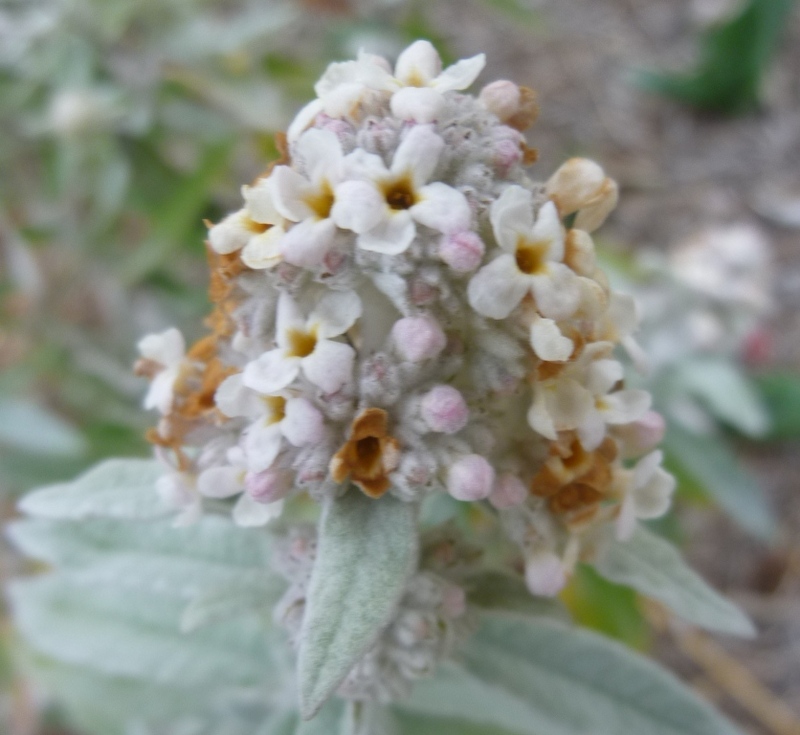 Let me know how this plant grows in your garden in your part of the world. 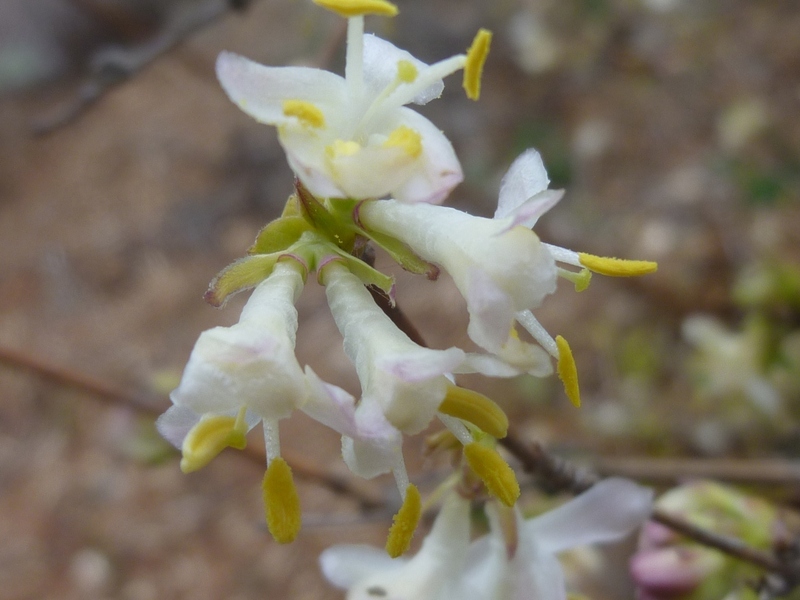 Long flowering Lonicera fragrantissima is still perfuming the air right by the drive where it welcomes us home as we get out of the car. 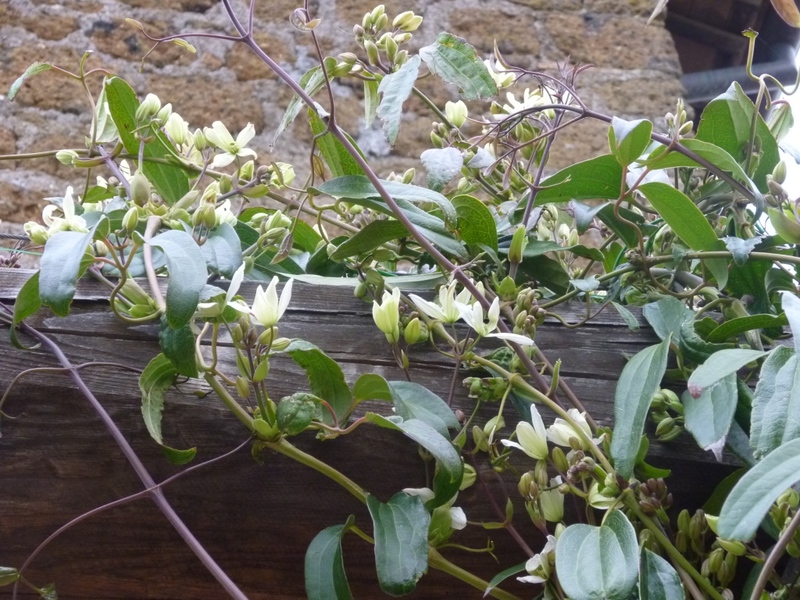 I think it will be over by next month’s Bloomday, as it isn’t a beautiful plant during summer I will try to think of a suitable small scrambler to flower over it during the summer months, sadly not clematis as they need too much water – maybe some kind of annual would be interesting. 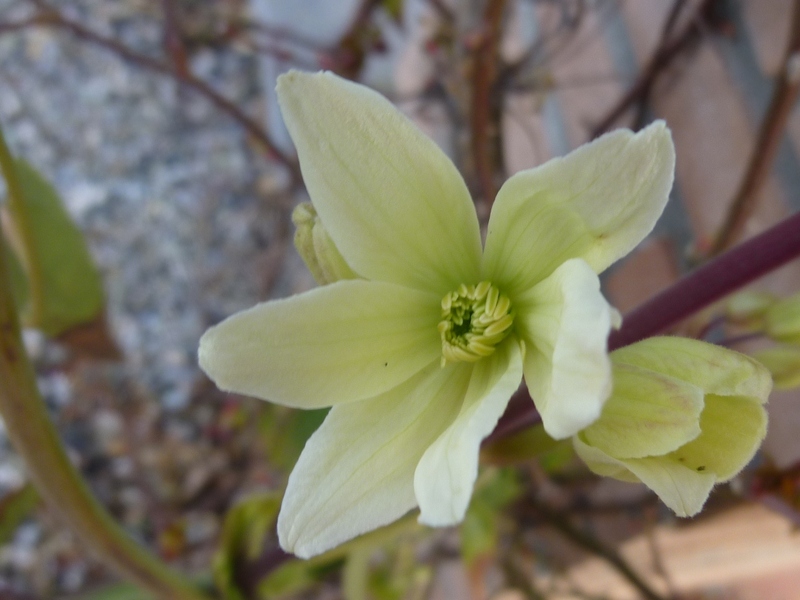 Clematis armandii began flowering with a few tentative blooms a couple of weeks, now many of the buds are open; last weekend in the high winds the tendrils looked like they were tenaciously hanging on for grim death to the supporting wires today they are happily opening more buds. 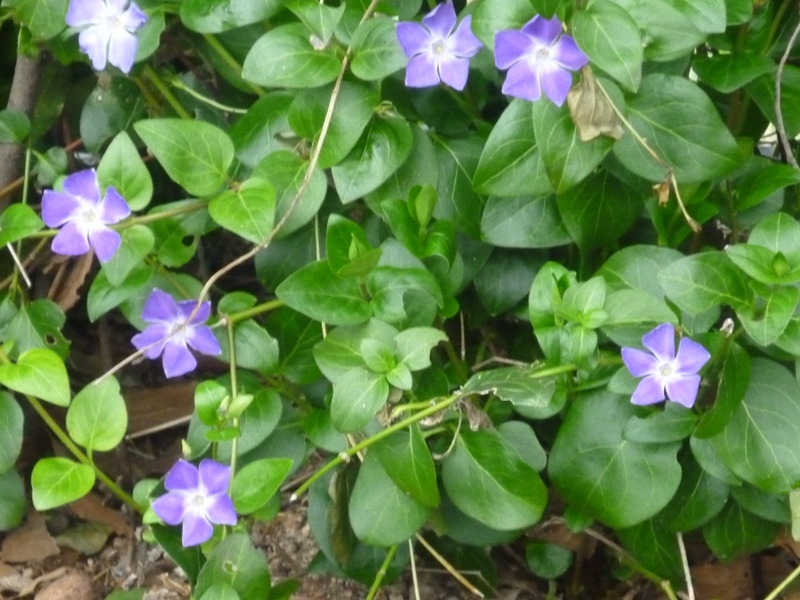 Periwinkle adds a blue note to the bottom of the bay hedge. 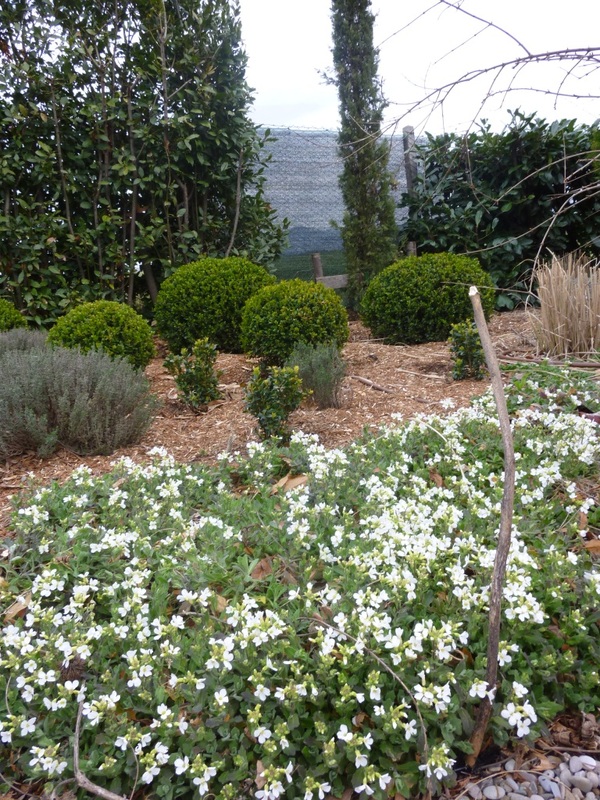 Arabis spreads its white flowers like a flurry of snow under the pomegranate towards Box balls. 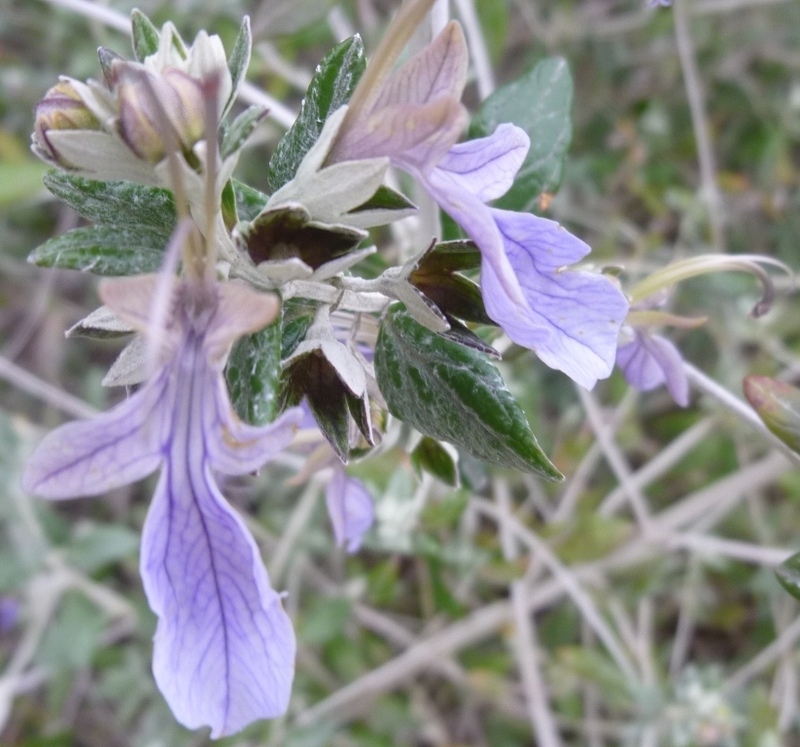 Teucrium continues to bloom and grow. 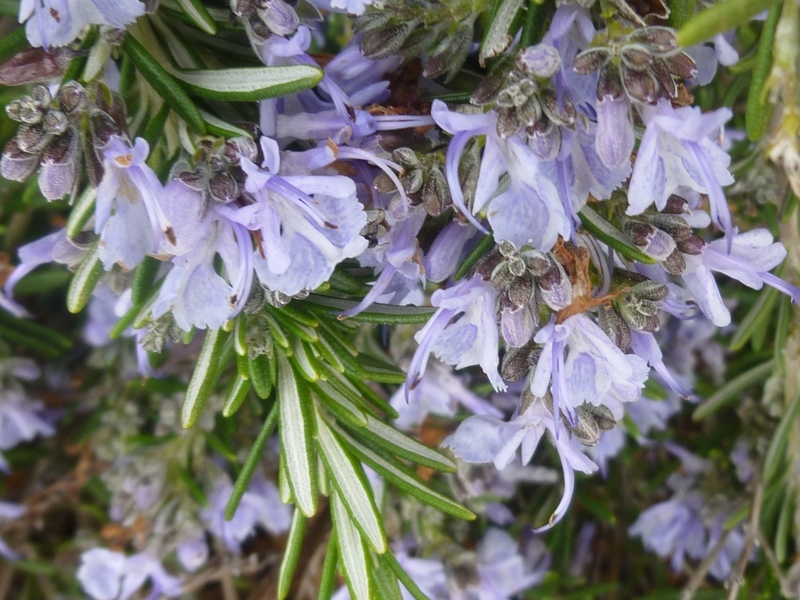 This is a plant that does very well and is useful as it is lovely and airy if left to grow unchecked or will become a strong form if tightly pruned into a ball or I’ve also seen it beautifully grown as a serpentine hedge (now where could I plant one of those?). This morning the sun is slowly breaking through the cloud and I need to finish cutting back and tying in the Raspberries – yes, I know I’m very late doing this but better late than never. 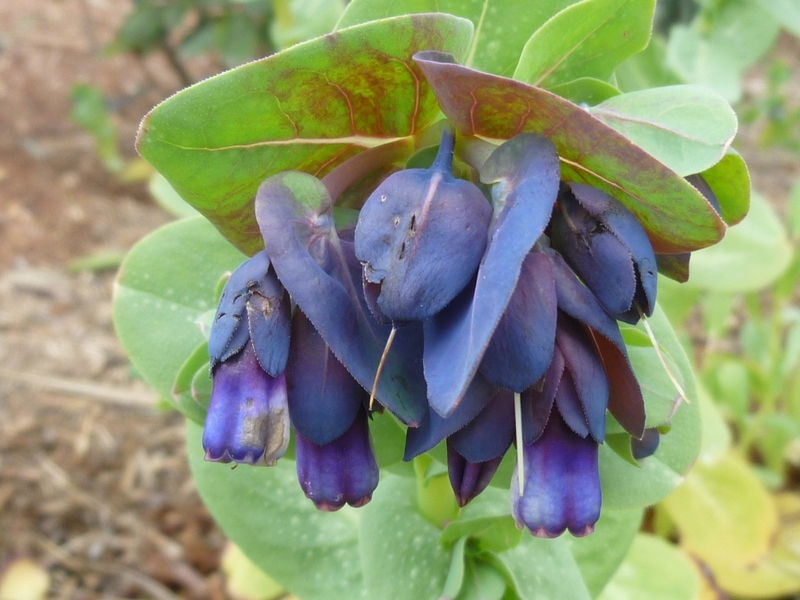 Thanks as usual to Carol at Maydreams garden for hosting GBBD for March, take a look at what’s flowering in gardens all over the world by visting her. 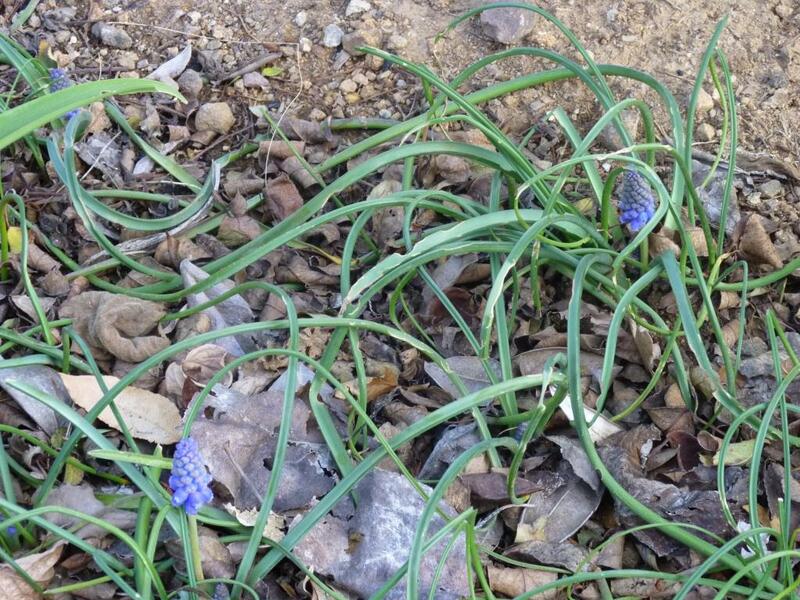 Today has been bitterly cold again; too cold to work outside but I di walk around the garden very quickly and discovered that things are beginning to happen. 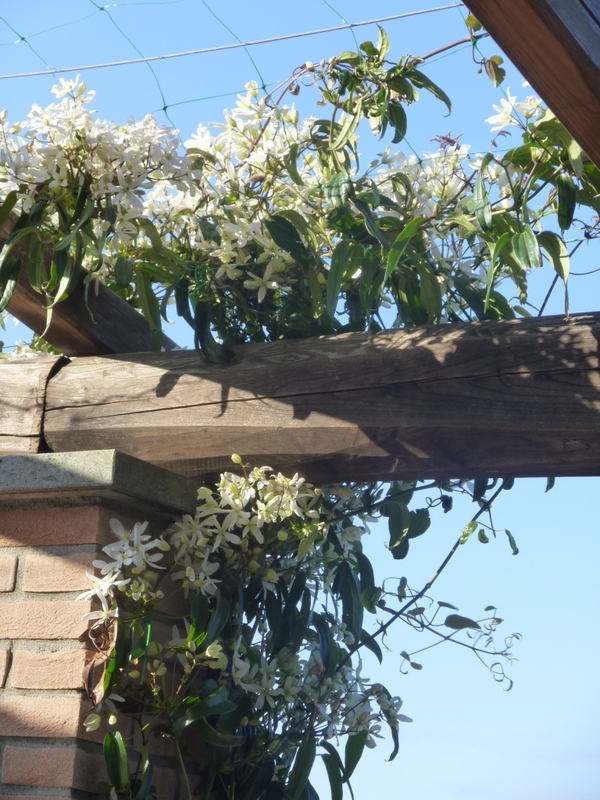 Clematis armandii has opened its first flower, this was low down, and probably getting some protection from the pillar and Rosa Clair Martin that is growing strongly, pushing out new shoots. 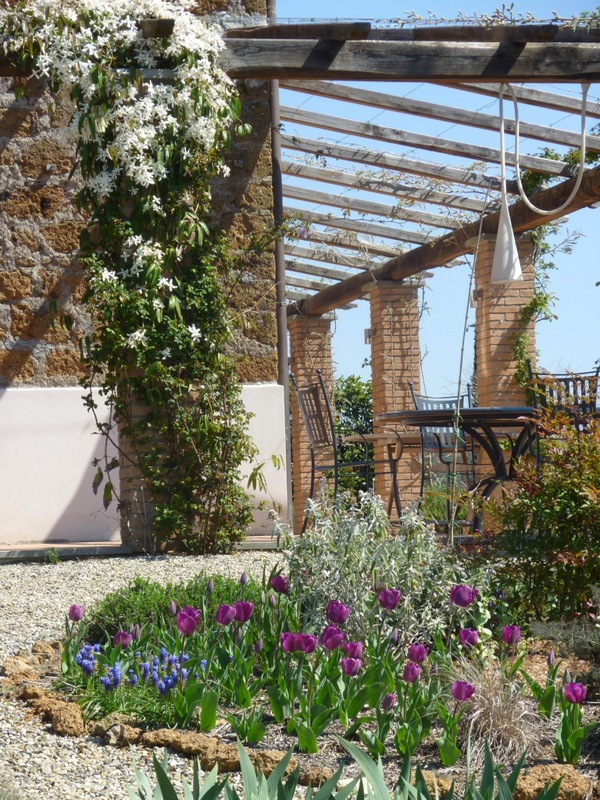 It was planted in autumn 2009 and is now beginning to inch its way across netting on the pergola around the house. 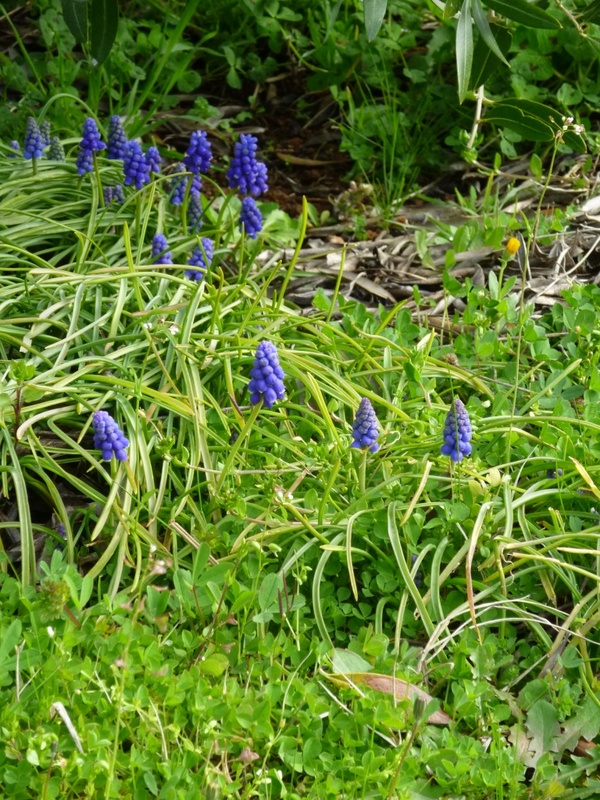 Muscari under the olives and in beds around the garden are now flowering, not just the odd one or two brave individuals as it was on Garden Bloggers Bloom Day. 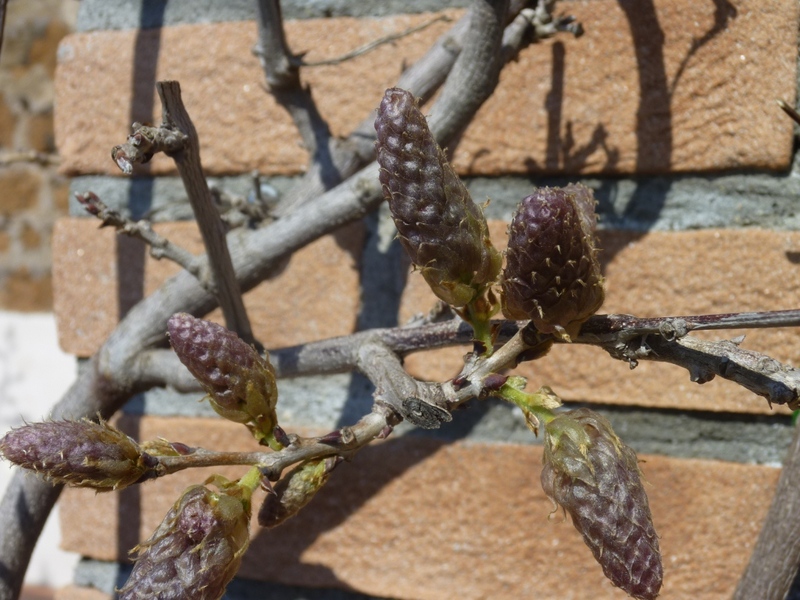 Rather satisfyingly, buds on Wisteria profuse are enlarging after the plants were pruned in January; they now promise flowers, when I’m not sure, either the end of March or beginning of April? 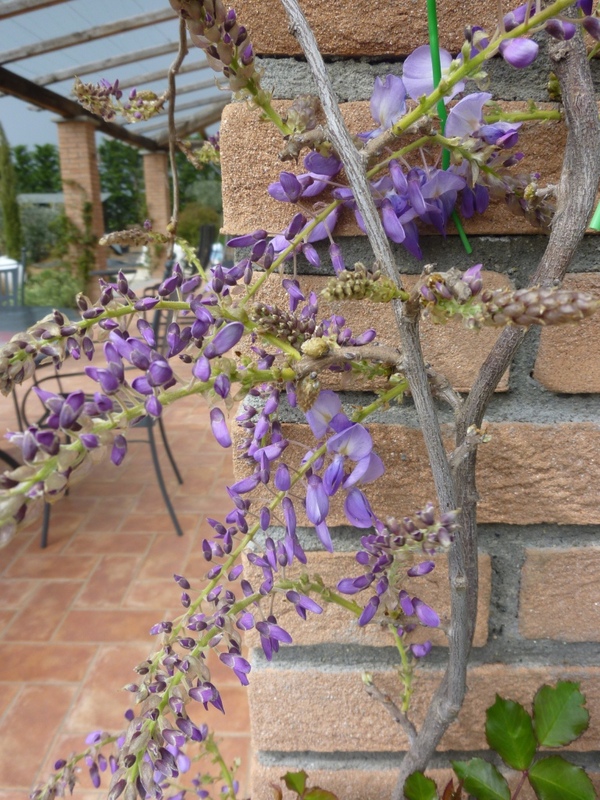 I love Wisteria and dream of when the whole pergola will be covered and dripping with flowers. 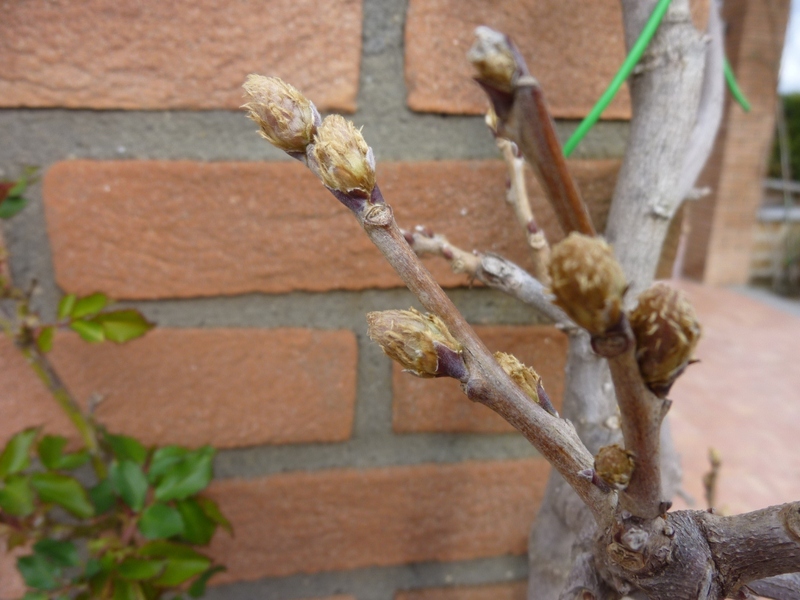 I think that it is this ‘promise’ of things to come that make me love gardening so much, without the buds and shoots it would feel so much like it was still the middle of winter rather than the beginning of spring.